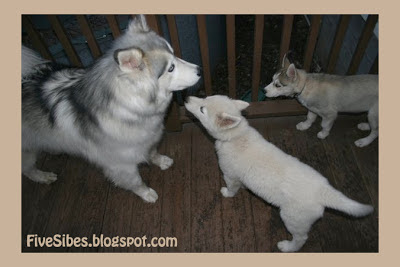 A flashback moment to March of 2008 when we first at almost two months old, we brought home "The Pupsters" - littermates Wolf, Bandit, and Chloe. Pictured here are baby Wolf and Bandit meeting big brother Gibson for the very first time! "A brother is a friend God gave you; a friend is a brother your heart chose for you." Please be sure to stop back here on Saturday for a very special drawing we will be doing! You won't want to miss entering! Grab our badge and join in! You can join our Flashback Friday Blog Hop up to a week after this posting! We hope you'll join us each week to kicking off the weekend with a stroll down Memory Lane by posting pics of your furbabies when they were younger on your blog, website, Facebook page, or Twitter, then copy our badge, link it to our blog site, and then join this Linkys list with your site's URL. Hopefully, we will have a few blogs, Facebook pages, Instagram photos, etc. to hop around and enjoy some "younger years" memories! And...you can join this hop up to a week after this posting! So come on and join us in "flashing back" to those younger years! THIS IS A BLOG HOP! JOIN US! Monday Musings: Take Time to Enjoy the Seasons! 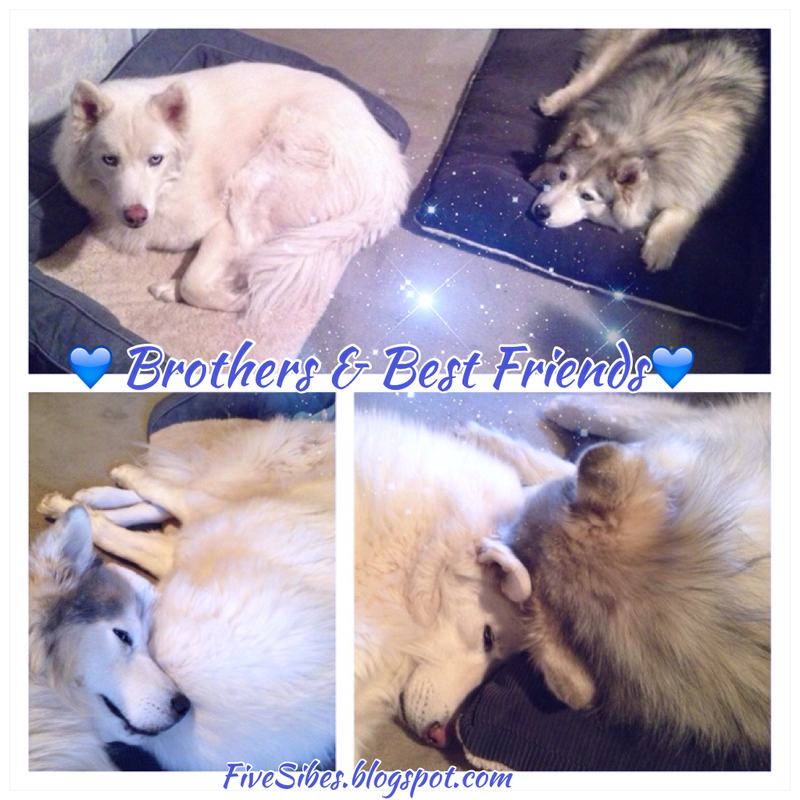 Wolf keeping big bro Gibson company while he heals. (remember his bout of severe toxicity a while back due to the pharmaceutical company changing capsule formulation?) he has become - thankfully - much more alert and energetic, so much so that he is running and jumping, and engaging in "polar bearing" with the other Sibes. It's our belief that he overtaxed his hip. He is currently on rest, a round of NSAIDs, and - bless our vet team - he will be receiving in-home K-LaserUSA treatments several times this week so I can keep him resting and not try to get him into a car. He is such a good boy and doesn't ever complain. Pictured above he is chillin' with little brother Wolf at bedtime, right beside my bed. I will keep everyone posted on how he's doing and will even post some pics of his in-home care when the vet techs come! All good thoughts welcome! I can remember this Flashback photo as if it was yesterday. 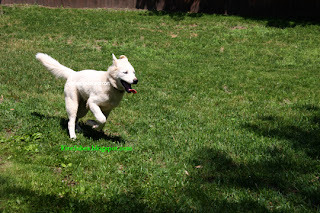 We had just turned the three six-month old Pupsters out to run free in the yard along with Harley and Bandit, and Wolf took off with the wind at his feet. The sheer joy in his face as his Siberian Husky ancestral trait of running kicked in was just amazing to see...and it still is! I read this poem over on PoemHunter.com and thought it fit perfectly! Hope you enjoy it as well. 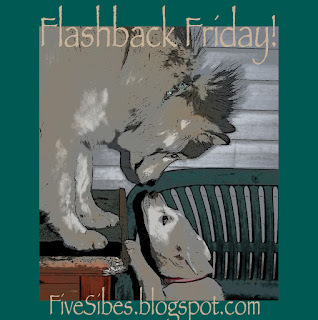 We hope you'll join us each week to kicking off the weekend with a stroll down Memory Lane by posting pics of your furbabies when they were younger on your blog, website, Facebook page, or Twitter, then copy our badge, link it to our blog site, and then join this Linkys list with your site's URL. Hopefully, we will have a few blogs, Facebook pages, Instagram photos, etc. to hop around and enjoy some "younger years" memories! A house filled with delicious smells of a turkey cooking in the oven, happy woos from the FiveSibes, the Macy's Thanksgiving Day Parade on the TV (the Sibe kids like watching it! ), and anticipation of visiting with family and dear friends fills today with love and joy. 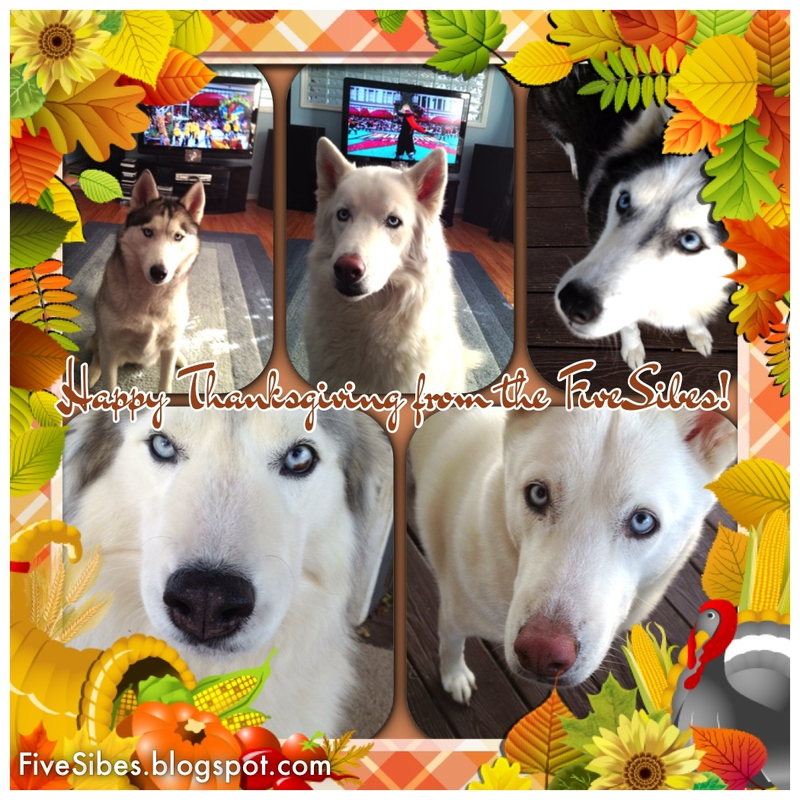 We are so thankful for our family, including our Sibe kids and kitty Binx; good health and happiness, old friends and new friends, and all of our furpals and families that we have connected with near and far through Blogger and social networking. May your day be filled with joy and happiness, and many things to be thankful for. 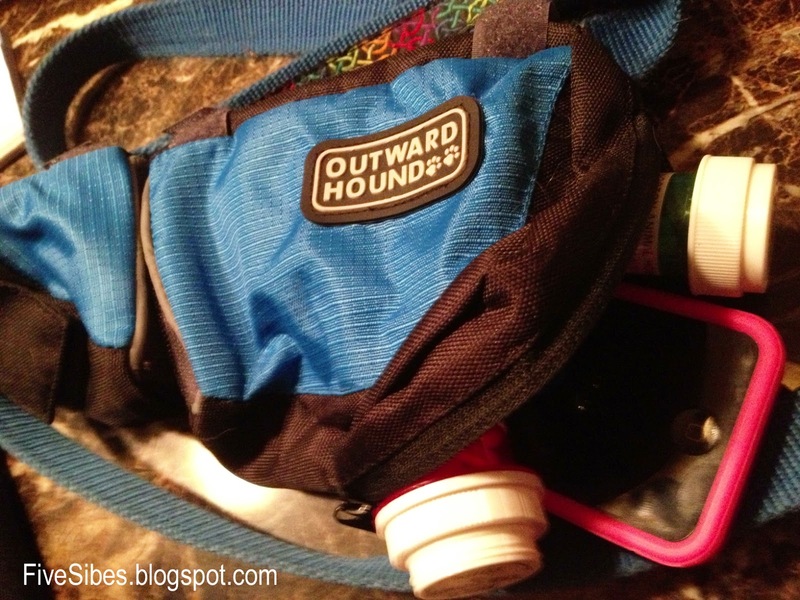 Boycott Boring: Kyjen's New Outward Hound Backpack & Leash Mate Area "Must Haves!" "Woo! Like my new cool backpack?" Our Bandit, who is partially deaf, is starting school to learn commands via a vibration collar and sign language. In perfect timing, I recently received a new Outward Hound Backpack in blue from the Kyjen company to test and review. First, let me just say that this backpack is awesome! There are two large pockets with plenty of room for leashes, treats, toys, and even a mesh zippered pocket so it can safely carry her vibration collar and remote to class. It's amazing just how much room is in this pack. Lots of space for essentials! The best part was when I hooked it all up on Bandit. She's never had any type of pack or coat on her, and when I put on the Outward Hound backpack, she didn't even flinch! Even while out walking to school, Bandit did not seem to mind having it on at all, which tells me it is quite comfortable for the dog. The pack also has reflective trim that is great when walking in the dark. Prices range from $36.99 for a small, to $54.49 for an extra large. 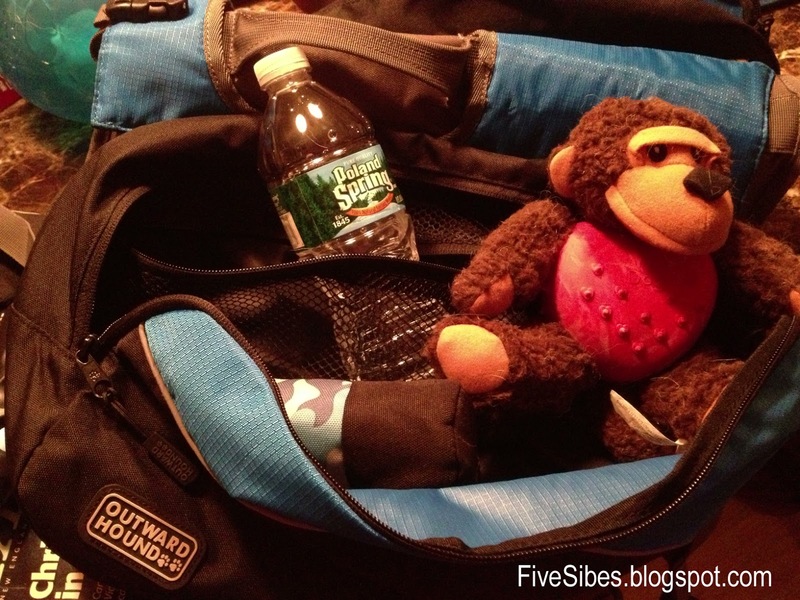 It's a great item for hikers on your holiday gift list, too! which connects by velcro to a leash and can hold quite a bit! It's perfect for taking along on walks and the pockets can hold several jar of medications and has plenty of room for even a cell phone, small wallet, and set of keys. There is also a smaller pocket for carrying disposable pick-up bags. A very handy item indeed for just $14.99! Leash Mate has room for phone, keys, wallet, bags & meds. Bandit of the FiveSibes™ gives these two excellent products a four-paws up rating! And remember, "Boycott Boring Toys" by visiting kyjen.com. What Is My Dog Thinking? Our 500th Post! Wolf kept his word! No chomping here! We all know our dogs think....a lot! Did you ever find yourselves wondering at times just exactly what their thoughts were? Well, a few weeks ago we put out a call for some "Thinking" photos (no shaming here!) and we received so many great pictures and lots of proof that our dogs are indeed thinking lots of different thoughts - some pretty funny and some very sweet! So go fetch some snacks for you and your furkid(s) and enjoy this video slideshow (our 500th post! Woo!) 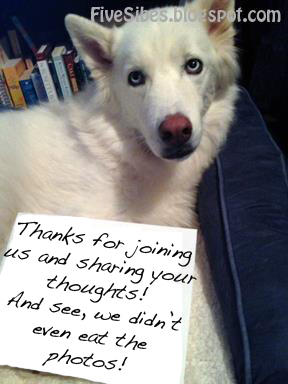 featuring gorgeous furpals from across the World sharing their inner most thoughts with us! You may even recognize a few furry faces! Our Baby Bandit, our "Thunder Paws" and "Crazy Girl" - she can run like the wind, fly through the air with the greatest of speed, and never pay attention to the humans she bruises when she lands! Her happy place is wherever a hand is to give her a belly rub, or a face she can kiss! She is most definitely a contrast in personalities! Unbeknownst to us at the time, her monicker would be a perfect fit. She was named due to her mask markings resembling a bandit's mask, but she grew up to be a real thief! Bandit loves to steal all the toys, bones, stuffies, and beds that belong to the other Sibe kids. She will pile them all under her and guard them. If she's in a chair, she'll grumble at any Sibe who walks by her "territory." Yet, she will instantly roll over for a belly rub from the hu-family. Bandit is not big on sharing, but she is - and has been since a pup - the most patient one of the pack. When asked to sit, she will immediately and then just wait for whatever you ask next. You can feed all the others and she will still be sitting and waiting. 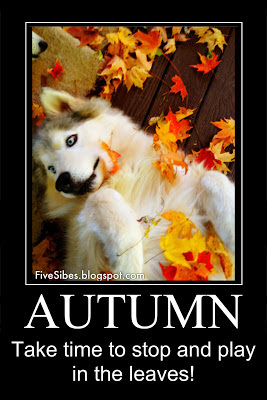 Unimaginable patience for the most hyper Sibe! Bandit, we have now come to discover, is partially deaf, which explains so many things. There are days she is off in "Bandit World" and we now know it's because she can't hear. We've adjusted signals and she's now enrolled in school for special training classes for her deafness and will be trained with a vibration training collar, and hopefully on the road to becoming a therapy dog. It's an exciting path I'm looking forward to travelling with our Banda-Bear! We hope you'll join us each week to kicking off the weekend with a stroll down Memory Lane by posting pics of your furbabies when they were younger on your blog, website, Facebook page, or Twitter, then copy our badge, link it to our blog site, and then join this Linkys list with your site's URL. Don't forget to hop over and visit the other hoppers' sites too! 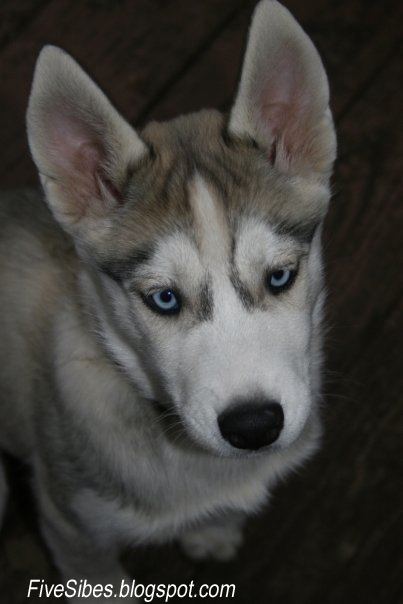 A Husky "Haroo" to Hollywood! Newsy Tuesday! 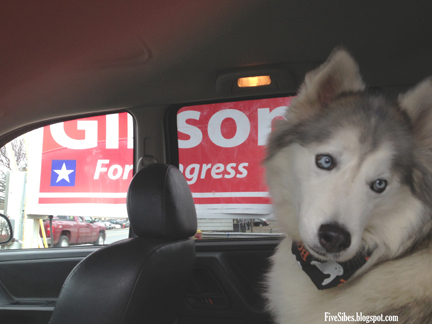 A Husky in Congress? Woo! It's me Gibson...I took control of Mom's laptop today to talk about Election Day. Speaking of shared names...while I was riding around town with my Mom, imagine my surprise when I saw I was running for Congress! Woo! When I saw the first sign that said "Gibson" - I wooed and poked at the car window with my nose so Mom would see. But she said she already knew. I was so excited! That's a really good name! I should know! So I asked Mom if I had a campaign office like other human candidates...and she said 'Yes!' Woooo! I wanted to see my office, so we drove over...I was so excited when we pulled in. I was greeted by a really BIG bulletin board with my name on it in all of our beautiful American colors. Arooo! 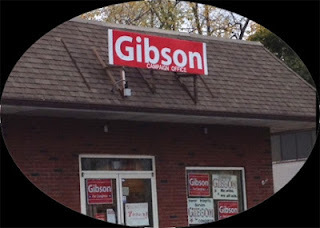 There's my campaign headquarters...looks very Gibson-y and patriotic. I like it! Good job campaign woofers. What's that? The media is here for my press conference? Photographers? Woo...I'll give them my best side. How's this? Hey, Mom, maybe Bloggerville Mayor Frankie and I could meet over some water and bones to discuss some canine politics? Woo! That could be fun! Live Gib Strong: November is (Canine) Epilepsy Awareness Month. Send Us Your Stories! "I hope we can help other Epi-Dogs." 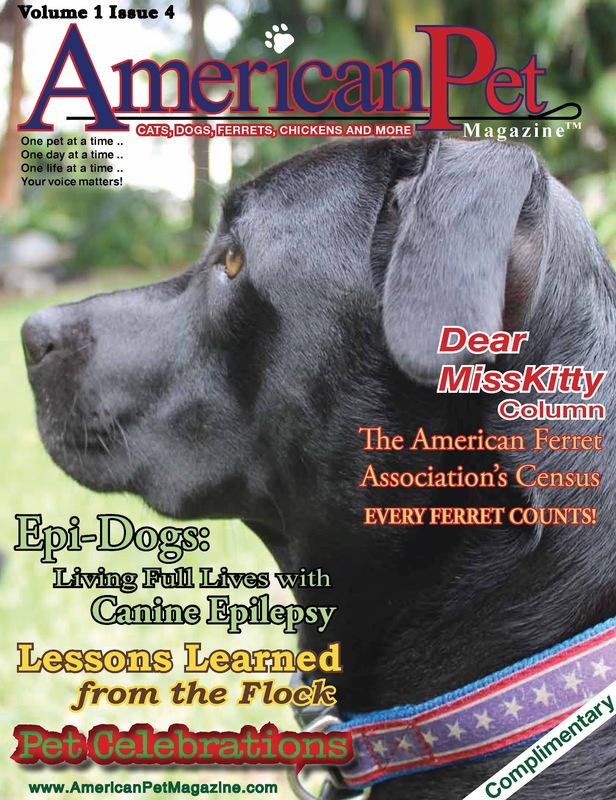 November is Epilepsy Awareness Month and the perfect time to talk about Canine Epilepsy (CE). As many of you know, I am the parent to an Epi-Dog, my Siberian Husky, Gibson, who was diagnosed shortly after his third birthday in 2009. 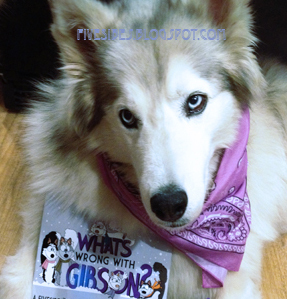 I have written many times about Gibson's experiences and my book, What's Wrong With Gibson? Learning About K-9 Epilepsy was based on those experiences and shared in an illustrated book perfect for young children to learn about seizures and Canine Epilepsy in a non-scary and helpful way. First, I have to say, it took me a couple years to be able to step out from behind the fear of Canine Epilepsy to actually talk about it. As any Epi-dog parent can tell you, when you are having a good day, you do not want to even whisper it in case the "seizure monster" hears and decides to come back with a vengeance. Every moment, that turns into a day that turns into a week that turns into a month, and for every month that turns into two...and so on, is a good thing. That is what we Epi-dog parents look for - those times between seizures with the hope that there will not be another seizure. We secretly celebrate those moments as little private victories, ones we are to scared to share. And they are victories. Canine Epilepsy is an uncharted terrain. Even treatments are not a certain. Awhile back I posted about when Gibson had a very serious reaction to a reformulation in his Potassium Bromide capsules, (for full story, go HERE) that while he thankfully did not have a backlash seizure, he was seriously and neurologically ill until it was once again managed. But is it really? I hope so. I pray so. But I don't really know. I did and do everything within my power to keep him balanced, and a pharmaceutical company - without notifying the veterinarians or public of their change - flipped Gibson and my world upside down. And there are possible side effects to the meds. We run full blood panels on Gibson every few months to be sure his liver functions are within the normal range. So...yes, there are treatments both medical and holistic. Yes, there are dietary recommendations. Yes, there are studies. But, in my opinion, until there is an actual cure, CE and its treatments will remain like the wild, wild West...sometimes wild, sometimes quiet, but never for certain. So all we have are our private little victories to hold on to and pray will continue. I am extremely excited to announce the official launch of my "Live Gib Strong" K-9 Epilepsy Awareness campaign for 2012! Through this campaign I hope to help educate and spread the word that dogs who have seizures and/or Canine Epilepsy can - and DO - live full, happy lives. With lots of love and some special care, these dogs are living life to the fullest. Canine Epilepsy once meant a death sentence for dogs - that is most definetely NOT the case today. There are so many options and treatments available, ranging from medicinal to holistic, and dietary and environmental changes that can help an Epi-dog live life even with Canine Epilepsy and/or seizures. Is it always easy? No. Is it cheap to treat? Maybe yes, maybe no. Is it worth it? Absolutely. Without a doubt. The love from my Gibson is all the proof I need that CE will never stop me from loving and caring for him and together we hope to remain "Gib Strong" in our fight to bring awareness and education to people about dogs being able to live life with CE. And also a tribute to the loving parents, rescue volunteers, foster parents, and others who love and care for an Epi-Dog. Cover of the Resource brochure. For this campaign - there is so much going on! 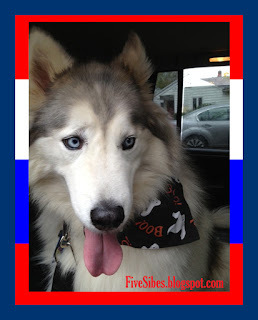 First, the "soft" launch took place last month at the Tails of the Tundra Siberian Husky Rescue's "Tails on the Trails" fundraising event in Pennsylvania where I attended and met so many wonderful folks, beautiful Sibes and other breeds, and some Epi-dogs! 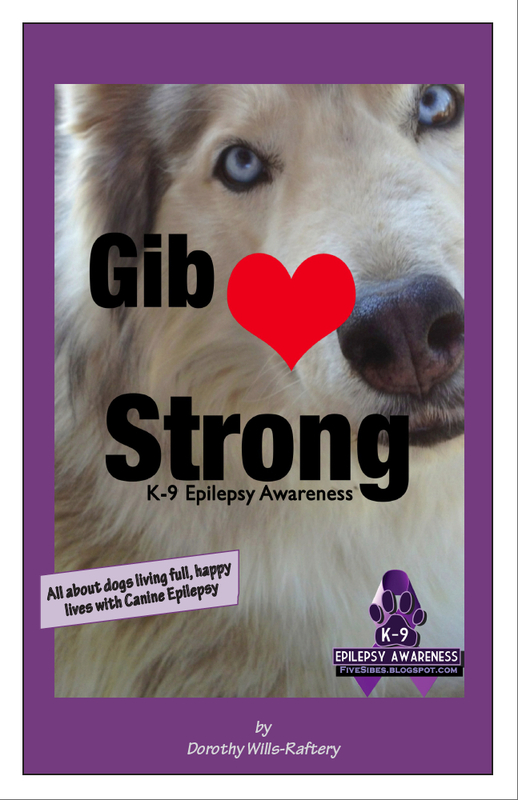 What a wonderful reception we received for our campaign, which consisted of a Gib Strong K-9 Epilepsy Resource Awareness booklet that contains valuable links and informational websites for Epi-dog parents, as well as items for an Epi First Aid Kit. There are also some amazing testimonials and photos of Epi-dogs from across the world who shared a part of their stories of living life with Canine Epilepsy. 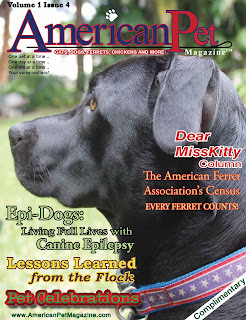 You may even recognize a few of our furpals in it! These glossy keepsake booklets are available for $3 just to help defray the printing costs. 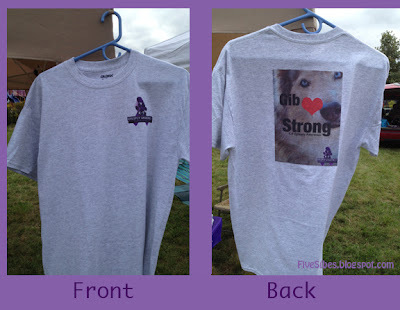 We also have "Gib Strong" T-shirts ($18 and $20) and purple "Live Gib Strong" rubber awareness bracelets ($2), and handcrafted beaded awareness charm bracelets that will be available for purchase (with a portion being donated to the Canine Epilepsy Awareness center) for a limited time. "Woo...that bracelet has my name on it!" 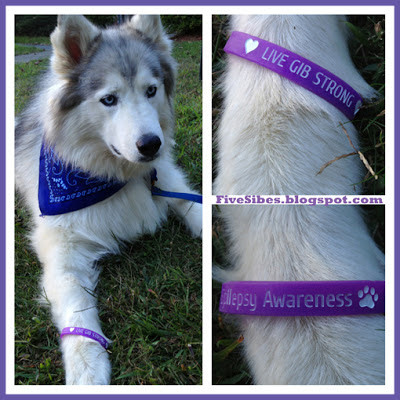 For every rubber "Live Gib Strong" bracelet ordered, $1 will be donated to Canine Epilepsy Resources. The beautiful beaded charm bracelets I've commissioned from my artist daughter (who soon will be opening an Etsy store with her beautiful creations). She is creating these beautiful semi-precious purple beads with silvertone and pawprint beads and a charm of choice exclusively for us on a "made to order" basis (which means please allow several weeks for delivery after payment). You can order the bracelet with your choice of two silver charms - either "pawprints on a heart" or "rhinestone ribbon heart" charms...or order one of each! They are $25 each (and one size fits most. If you need a larger size, just let us know!) 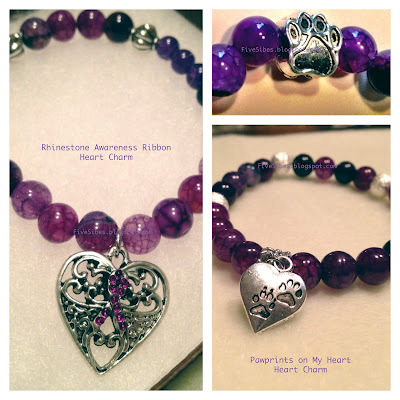 A percentage of these bracelets will benefit the Canine Epilepsy Resources. Heather gray "Gib Strong" T-Shirts in Medium, Large, XLarge, and XXL. For all of the rest of the items sold, including my What's Wrong With Gibson? 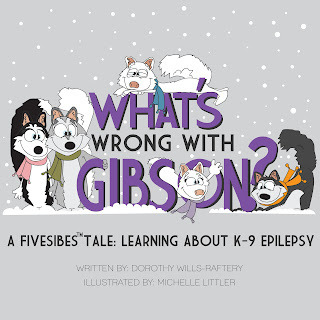 Learning About K-9 Epilepsy illustrated book, will have a percentage donated to the Canine Epilepsy Resources center so they may continue their work to help Epi-Dog parents worldwide. To check out these items, visit our site at ArcticHouse Publishing. (Note: If you wish to order just one of the brochures or the rubber awareness bracelets, contact me via Email at ArcticHousePublishing(at)gmail(dot)com for a separate lower shipping price, or you can order them in combination with other items directly from my ArcticHouse Publishing website). 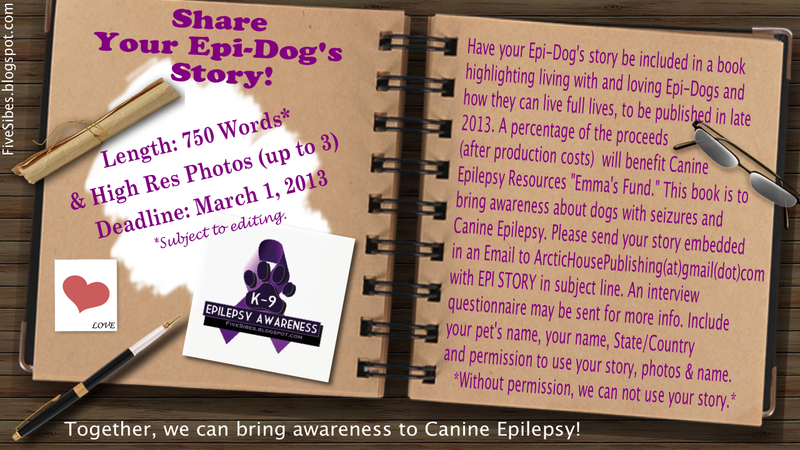 We Want Your Epi-Dog Story! 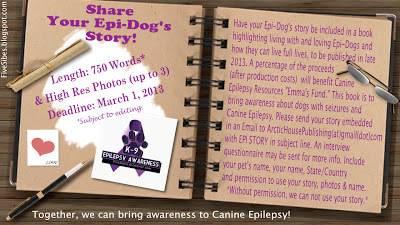 After such a wonderful response from fellow Epi-dog parents who shared their dogs' stories of living with Canine Epilepsy for my Gib Strong awareness brochure, I am now inviting you to share your Epi-dog's story and photos in a book I am working on that is scheduled to be published next year that is all about our loving, wonderful Epi-dogs. 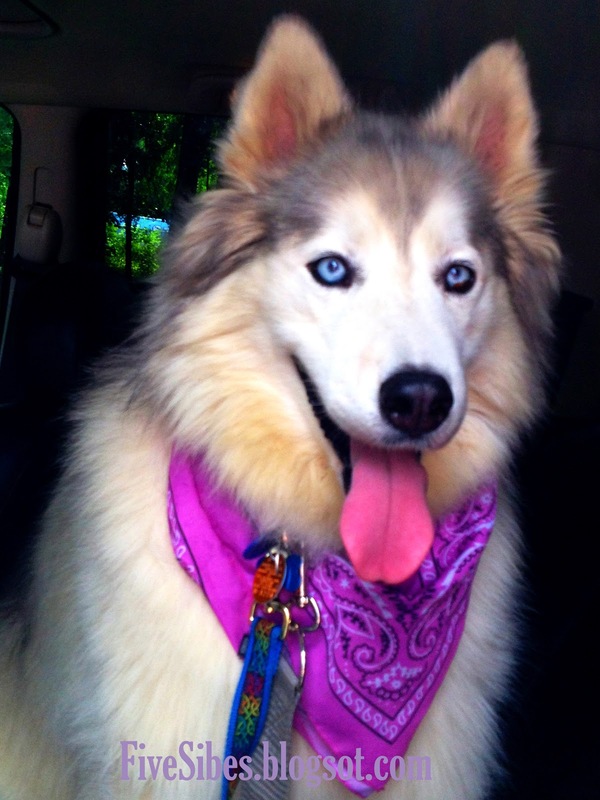 Here's the scoop: Send me your 750 word length story of living with an Epi-Dog and how/when your Epi-Dog was diagnosed, and how she/he lived/is living life to the fullest, even with a seizure disorder. Please embed your story into an Email with "EPI STORY" written in the subject line. Also include a high resolution photo (up to 3 photos), along with your dog's name, your state and country, and state in the Email that you are giving permission for your dog's story and photos to be included in the book (without permission, we can not use your story). Stories are subject to editing. When the book is completed and published, a portion of its proceeds (post production costs) will be donated to Canine Epilepsy Resources "Emma's Fund." Deadline: March 1, 2013. Stories and photos should be mailed to ArcticHousePublishing(at)gmail(dot)com. Mark your calendars! On Sunday, November 11 at 1 PM EST, on our "The Sibe Vibe" radio show, my co-host Robert Forto of Dog Works Radio and I will be chatting with special guest Marion Mitchell, site owner and manager of Canine Epilepsy Resources, which is filled with valuable information and resources for Epi-dog parents worldwide. It is also home of the EPIL-K9 Emailing list, where fellow Epi-dog parents chat with each other via Email about their Epi-dogs, symptoms, and medications while also offering support and valuable information to each other. Marion is also the Hu-Mom to several Dalmatians, including furangel "Emma," the original face of Canine Epilepsy and the namesake for "Emma's Fund," a memorial fund through the Neurology Department of the Veterinarian School at North Carolina State University. Emma's Fund also where a portion of my book, What's Wrong With Gibson? 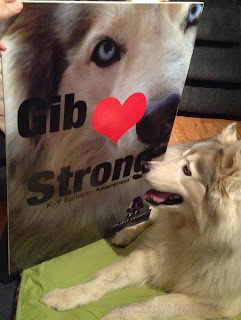 Learning About K-9 Epilepsy, and the other "Gib Strong" awareness items will be donated. We hope you can join us for this very informative show, (click HERE for live show's link), but don't worry if you miss it...we will be posting a permalink on this blog right after the show so you can tune in any time! "Woo! That was a lot of news, Mom!" Yes, it was Gibson. And we sincerely thank everyone for reading it all as it is so important to us. Through education and awareness, we hope folks will realize that dogs who have seizures and/or Canine Epilepsy - with lots of love and some special care - can live full and happy lives, however long we are blessed to have them. Thank you for sharing our story and supporting Canine Epilepsy Awareness. We hope all Epi-dogs and their families will stay "Gib Strong" in the fight against that sneaky seizure monster. "Canine Epilepsy" in the search box on the top of this blog page. Saturday Pet Blogger Hop, too!